OPM rock songs of the 90's are very much alive today. 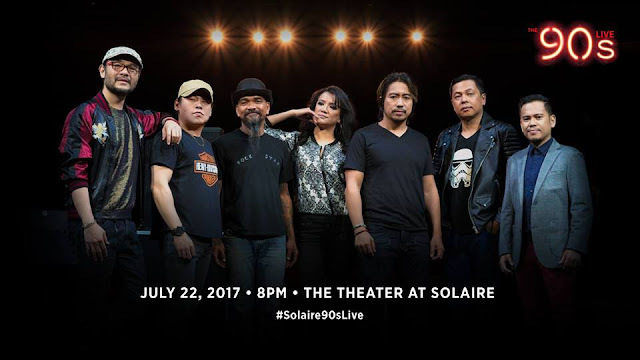 I'm very happy to have witnessed songs from our childhood come to life again thanks to The 90's Live show at The Theatre (Solaire Resort and Casino) on July 22, 2017 (yeah, I know, very late post haha). The venue isn't as large as more popular concert halls but the place was still jam packed. While Solaire is known to provide a more private environment with an upper class type of audience (I'm not, by all definitions XD), the crowd was very receptive and lively. It started with Jett Pangan (The Dawn) singing Enveloped Ideas. He also performed Talaga Naman. I was bit disappointed when Paco Arespacochaga (Introvoys) already took his turn after just 2 songs from Jett; not knowing there will be more surprises later on. Paco sang Kailanman. It was followed by Di Na Ko Aasa Pa. He shared the video on his own website. Thank you Mr. Paco! Paco stayed on the stage to play the drums for Wency Cornejo (Afterimage), who sang Mangarap Ka. Another artist also joined Wency on the stage. It's Cooky Chua (Color it Red). They performed the epic hit Habang May Buhay. Wency said it's the first time they performed the track the way it was intended to be, a duet. The track was released as a solo back then because their recording companies (and management) did not allow them to record the song as a duet. Cooky sang "Na Naman" before passing on the mic to Medwin Marfil (True Faith). Medwin sang Huwag na Lang Kaya and Alaala. He was struggling with some lyrics at some point though. Even those who watched the video had noticed the same. I don't have a photo for the next performance but Naldy Padilla (Orient Pearl) sang Kasalanan before Dong Abay's turn. Abay performed Yano's hit, Tsinelas, complete with an actual torn slipper for props. He also sang Esem. It was during his parts when the audience was the liveliest. Next comes Perf de Castro, the original guitarist for Rivermaya. He performed Ulan and Awit ng Kabataan. I have no photo and I'm sorry if I take videos (as most of us did). It doesn't mean I'm not enjoying the moment. I just want to enjoy it more by being able to watch the videos all over again and share it to everyone else who wants to see. So, peace! And on with the show... Prettier than Pink's Lei Bautista comes next with their cover of Ang Boyfriend kong Baduy. Wency stayed on stage with Multo sa Paningin by The Youth. Jett performed Laklak by the Teeth, Dong with Long Hair by The Weedd and Cooky with Huling El Bimbo by Eraserheads. Too bad I don't have snaps of Abay's long hair look. The image above was from the earlier performance but when it was Lei's part to sing a cover, Your Love by Alamid, the stage became more solemn. There were images and videos of 90's music stars who have passed on to the next life flashing on the screen, including Francis M. Perf performed the Master Rapper's hit song Kaleidoscope World. Perf de Castro continued performing and sang the iconic 214. He also played with Mike Villegas while Cooky sings Paglisan. The rest of the hits continued with Naldy and "Pagsubok", Jett with "Iisang Bangka" (Naldy was still there), Dong and "Banal na Aso", Lei with "Cool Ka Lang," Medwin and "Perfect," and Paco with "Line to Heaven." Wency's Next in Line was extended. He dedicates the song to his son and shared a spotlight with his mom, popular broadcaster, Mel Tiangco. There were other celebrities on the audience too, including Nelson Canlas, who was most likely covering for GMA 7. The show culminated with Salamat by the Dawn, which is the best part of the show in my opinion. Maraming salamat 90's rock icons for the best music of our younger years!